Goodreads: From the author of the award-winning novel Buffalo Lockjawcomes a powerful collection of darkly humorous short stories. A young girl uses a burnt log for her ventriloquist act; Franz Kafka and an unnamed narrator cruise a dive bar for women; a grieving couple stage and execute their own funeral; a son brings hot chowder to his caged parents. This stunning collection―packed with moments of violence and tenderness―explores the humor and unease of modern life. Since he first began publishing his fiction, Greg Ames has been praised for his willingness to take risks and the strength and freshness of his voice. Assembled here for the first time, this collection brings together the best work from a brilliant American writer, a playful and innovative artist. 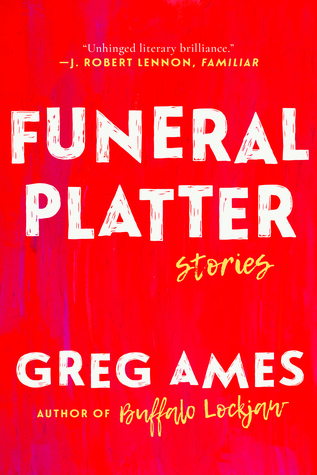 In these twenty original short stories, Greg Ames earns his place as one of the best writers of his generation. Kritters Thoughts: When pitched this book, I was excited to do another short story collection in 2018, I am hoping to read more about of my usual comfort zone in 2018. I rate a short story collection based on my feelings on the stories and if I would want any of these stories to be full blown novels. I didn't want really any of these stories to have more time, the plots weren't compelling enough to make them longer than a short story. Unfortunately, most of the characters in these stories seemed the same and were completely beyond neurotic and nutty. After the first few stories, I just felt as though each story had the same main character and not only did I not love them, I didn't want to keep reading with the same guy taking front and center of each story. Now it wasn't the exact same character, but same traits and same personalities. I was sad not to fall in love with this collection, but am still optimistic that I will find a collection that I love. Disclosure of Material Connection: I received one copy of this book free of charge from Skyhorse Publishing. I was not required to write a positive review in exchange for receipt of the book; rather, the opinions expressed in this review are my own.